The Outreach (Exceed and Excel) x Mini (Reset) colt captured our eye from the moment that we saw him as he is a cracking type with a tremendous athletic walk. He is the absolute spitting image of his sire Outreach right down to the exact same white markings. The colt is bred on the same highly successful Danehill/Zabeel cross as such topliners as Lankan Rupee, Darci Brahma, Atlantic Jewel, Samantha Miss, Seabrook and Commanding Jewel. His sire, Outreach had his debut race in the Group 3 ATC Canonbury Stakes and despite fracturing his pelvis in running, he managed to finish a gallant second to the eventual Golden Slipper winner Vancouver. The injury he sustained however was career ending and the valuable colt was retired to stud. Outreach’s sire, is the reigning World’s Leading Sire of Juvenile Stakes winners the super sire Exceed and Excel (Danehill), Grandsire of current Golden Slipper winner KIAMICHI. The colt’s dam Mini only raced once but is a half sister to stakes winner and 2YO Group performer Morvada. His maternal family is bursting with black type winners such as Zonda, Magnolia Hall, Man of Honour, Dixie Blossoms and Surprize Surprize. 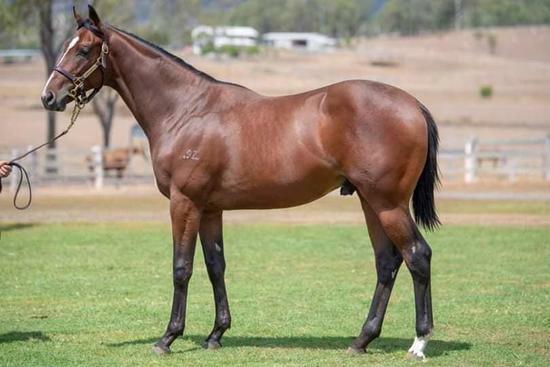 The colt is QTIS, BOBS NSW and Magic Millions Race Series Eligible so he has plenty of opportunity to earn added stakes to repay his purchase price of $34,000.